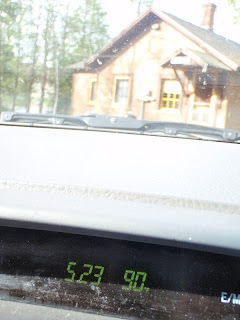 Arrive for the Spring trip to 90 degrees at 6:23 PM - at least that is what the dashboard thermometer said. I think I trust this old analog thermometer on the shed more than the high tech digital thermometer in the dashboard of the car. It felt more like 80 than 90. 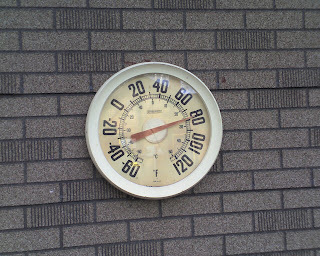 In any case, it was a record breaker of a day, with several 90 degree highs across the UP. hows the cabin look in the inside ? water on ? The cabin inside looks pretty much exactly the way you and I left it last January. Which is to say fine... but I was still somewhat disappointed that the Cabin Fairies did not make an appearance in the intervening time and do a complete cabin makeover. One thing. There are no throw rugs. Did you bring them back to Chicago in January? If so, please remember to return them now. We kind of need them.